A state of South India, Tamil Nadu is place which is known for its natural beauty. Apart from the Backwaters and the South Indian Delicacies, it is also known for its Coffee Plantations. Tamil Weddings can either take place in the morning or in the night as per the convenience of the bride and bridegrooms family. The Cultural and Traditional customs are of more important than any other thing in a typical Tamil Wedding. Tamil people are more Scholaristic People and hence they have a simple Marriage Ceremony. They do not believe in much Pomp and Show. All the rituals are simply carried out in the day light. 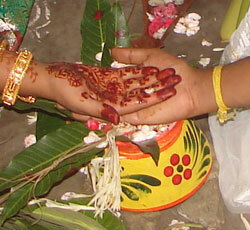 Usually a large Wedding Hall is booked for the Marriage and most of the rituals are carried out in the hall. 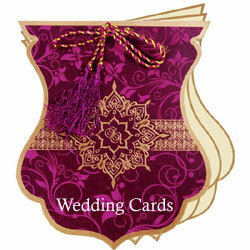 The date of the Wedding is generally fixed after consulting the Hindu Calendar. Usually in the months of July 15 th to August 15th, September 15th to October 15th and December 15th to January 15th; the Tamil Weddings are not held. These months are not considered to be good for marriages. Panda Kaal Muhurtham : A day before the wedding, the parents of the Bride and the Bride Groom take the blessings of the God. This ritual is called Panda Kaal Muhurtham. Pallikai Thelichal : In this ceremony the family of the bride fill the earthen pots with grains. Then the ladies from both the sides sprinkle water on these grain filled pots. The wedding songs are sung and the dances done. Next day as soon as the grains have sprouted , these earthen wares are put in the pond for the fish to eat. It is supposed that the Fish God, thus blesses the to-be-couple. Naandi : In this ritual a few Brahmins are invited from both sides of the family for a feast. On the completion of the feast, the Brahmins are gifted with sweets and clothes. The Brahmins on the other hand bless the bride and groom for a happy married life. Nicchiyadharatham : Lord Ganeshas Pooja is done in the presence of the priest. During the Puja/Prayer, the grooms side gives a Saree to the to be Bride, which she wears during the wedding ceremony. A tilak is applied on the brides forehead and her saree is filled with Cashewnuts. Lagan Patri : In the end, the priest formally reads out the Marriage Invitation in front of all those present, thus formally inviting all to the Wedding. Mangala Snaanam : On the day of the Wedding, the bride and the Bride Groom are supposed to take a purifying bath in their respective homes at dawn. This bathe is known as Mangala Snanam. Kashi Yatra : In this ritual the groom pretends as if he is leaving on a pilgrim (Kashi Yatra). Taking a walking stick in his hand with a couple of clothes in it and wearing a Sadhus Dress, he moves on from one house to house. In this pretext, the brides father intervenes and requests him to take the responsibility of his daughter. To this the Groom relents and enters home to get ready for the wedding. Exchange of Garlands : In this Ceremony, the Bride and the Groom are supposed to exchange garlands. They are supposed to do so in the first chance itself. Oonjal : After exchanging the garlands, the bride and the bridegroom are made to sit on a Jhoola/ Swing. The Married women of both the families give spoonful of milk and banana to both of them to eat. Then the women make rice balls in a circle, in anticlock direction. this procedure is supposed to ward away the evils. Kanyadanam : In this the parents of the bride give the hand of their daughter to the hand of the Groom, signifying that the groom is now taking the responsibility of the bride. Saptapadi : In Satapadi, the groom takes the Brides right hand in his hand and leads her around the sacred fire. This procedure is done seven times by the groom and the bride. Satapadi marks the solmenization of the Tamil Wedding Ceremony.